October 18, 1966 Cyril Valentine Briggs, writer and political activist, died. 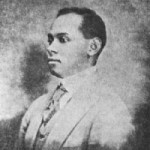 Briggs was born May 28, 1888 in Nevis, West Indies. He moved to New York City in 1905 and got his first writing job at the Amsterdam News in 1912. In 1917, Briggs founded the African Blood Brotherhood to stop lynchings in the South and racial discrimination in the North. By the mid-1920s, the ABB began to lose influence and Briggs lived out the remainder of his life in relative obscurity. ← October 17th in African American History – Lerone Bennett, Jr.